Lenovo's competitor for Google Glass is expected to go on sale in early September for no less than $1,298 USD, loaded with Android 4.0.4 and aimed at business users. Vuzix Corporation announced earlier today the signing of a deal with Lenovo for the launch of the M100 smart glasses in China. The product will be co-branded by both companies and will be sold by Lenovo as part of its New Business Development (NBD) brand. The commercial name will be "Vuzix 100 Smart Glasses powered by Lenovo NBD." According to the official press release, "The agreement between the companies calls for Vuzix to be the exclusive third party provider of smart glasses to Lenovo for the industrial and commercial markets in China and allows for the expansion into other geographical markets and products." The device is powered by a 1 GHz dual-core processor and comes loaded with Android 4.0.4. Unfortunately, no other details about the M100 are available at this time but during CES 2014 it has been revealed that this wearable will also sport a 10 MP camera. Vuzix M100 will go on sale in early September for roughly $1,300 USD but there is no information about pricing and availability in the US yet. ROCHESTER, N.Y., July 24, 2014 /PRNewswire/ -- Vuzix Corporation (OTC:QB: VUZI) ("Vuzix" or, the "Company"), a leading supplier of Video Eyewear and smart glasses products in the consumer, commercial and entertainment markets, is pleased to announce that it has signed a major deal with Lenovo, the world's largest PC company to launch the award-winning M100 Smart Glasses into China. The wearable product offering will be co-branded as a Vuzix/Lenovo solution and will be marketed across China as part of Lenovo's New Business Development (NBD) brand. The "Vuzix 100 Smart Glasses powered by Lenovo NBD" will be marketed exclusively by Lenovo. The agreement between the companies calls for Vuzix to be the exclusive third party provider of smart glasses to Lenovo for the industrial and commercial markets in China and allows for the expansion into other geographical markets and products. Vuzix has worked closely with Lenovo and their development teams to create a new M100 Smart Glasses product offering specifically tailored for the Chinese marketplace with features which include Chinese language, voice recognition, mapping and numerous other domestic cloud based services. This agreement is a major step for Vuzix and through Lenovo will bring it distinction as the first official Smart Glasses product to have direct access into China. As part of the partnership, Lenovo will begin immediate marketing of the co-branded Vuzix M100 Smart Glasses, with sales shipments commencing in early September and more broad based sales activities across China growing through the Fall of 2014. Paul Travers, Chief Executive Officer of Vuzix, said, "China is a significant milestone for us and for the wearable industry. Lenovo is world renowned for its high quality products and exceptional engineering, making them the most ideal partner with which to bring our M100 Smart Glasses to China. As Lenovo is number one worldwide in supplying computers to business and the public sector and the number 3 supplier of smart-connected devices (smartphones and tablets), we see strong market opportunities for our M100 as it was specifically designed for those markets. Additionally we hope the M100 is just the first in a line of future products the companies may introduce together incorporating Vuzix' video eyewear technology for sale in China and perhaps elsewhere." "Lenovo is always seeking new and innovative products that merge and integrate technology into products that offer our customers a high degree of functionality and convenience," said Mr. Yuli Bai, Vice-President, Lenovo Group, General Manager New Business Development. "The advent of wearable technologies and specifically Smart Glasses, exceeds that goal and provides a new level of mobility in computing and communications systems. As an established and leading supplier of smart glasses technology, Vuzix was an obvious choice for this strategic partnership." The Industrial Economics and Knowledge Center (IEK) under the government sponsored Industrial Technology Research Institute predicted that the wearable device market will reach US$20.6 billion in 2018, and in China is expected to reach 40 million sales volume and $1.9 billion market scale in 2015. Lenovo (HKSE: 992) (ADR: LNVGY) is a $US34 billion personal technology company and the world's second largest PC company overall, serving customers in more than 160 countries. Lenovo is the number one PC company in the world for large business and the public sector and ranked the #3 supplier of smart-connected devices such as smartphones and tablets. In China they have 70% market share in the commercial markets. Dedicated to building exceptionally engineered PCs and mobile internet devices, Lenovo's business is built on product innovation, a highly efficient global supply chain and strong strategic execution. Formed by Lenovo Group's acquisition of the former IBM Personal Computing Division, the Company develops, manufactures and markets reliable, high-quality, secure and easy-to-use technology products and services. Its product lines include legendary Think-branded commercial PCs and Idea-branded consumer PCs, as well as servers, workstations, and a family of mobile internet devices, including tablets and smart phones. Lenovo has major research centers in Yamato, Japan; Beijing, Shanghai and Shenzhen, China; and Raleigh, North Carolina. For more information, see www.lenovo.com. Vuzix is a leading supplier of Video Eyewear and Smart Glasses products in the consumer, commercial and entertainment markets. The Company's products include personal display and wearable computing devices that offer users a portable high quality viewing experience, provide solutions for mobility, wearable displays and virtual and augmented reality. 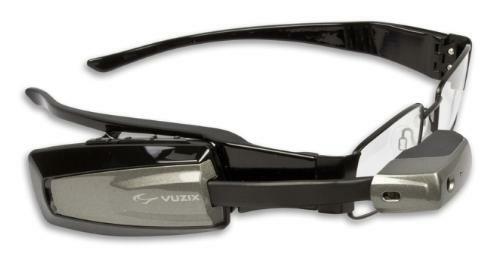 Vuzix holds 39 patents and 10 additional patents pending and numerous IP licenses in the Video Eyewear field. The Company has won Consumer Electronics Show (or CES) awards for innovation for the years 2005 to 2014 and several wireless technology innovation awards, among others. Founded in 1997, Vuzix is a public company (VUZI.QB) with offices in Rochester, NY, Oxford, UK and Tokyo, Japan. Certain statements contained in this release are "forward-looking statements" within the meaning of the Securities Litigation Reform Act of 1995 and applicable Canadian securities laws. Forward looking statements contained in this release relate to the impact and success of the Lenovo agreement and the new features and capabilities of the M100 for the Chinese marketplace, among other things, and the Company's leadership in the Video Eyewear industry. They are generally identified by words such as "believes," "may," "expects," "anticipates," "should" and similar expressions. Readers should not place undue reliance on such forward-looking statements, which are based upon the Company's beliefs and assumptions as of the date of this release. The Company's actual results could differ materially due to risk factors and other items described in more detail in the "Risk Factors" section of the Company's Annual Reports and MD&A filed with the United States Securities and Exchange Commission and applicable Canadian securities regulators (copies of which may be obtained at www.sedar.com or www.sec.gov). Subsequent events and developments may cause these forward-looking statements to change. The Company specifically disclaims any obligation or intention to update or revise these forward-looking statements as a result of changed events or circumstances that occur after the date of this release, except as required by applicable law.